This puzzle consists of a wide hexagonal body made of two layers. At each edge of the hexagon and parallel to it lies a small cylinder consisting of six coloured segments, such that three segments lie in the top layer, and three in the bottom layer. The two layers can rotate with respect to each other, so that the pieces of the six cylinders are intermingled. Furthermore, each cylinder can rotate any multiple of 60 degrees about its axis, so that the pieces can move between the layers. When solved, the six pieces of each cylinder have the same colour. The pieces of one colour are not identical however, as they each have a different number of dots on them. 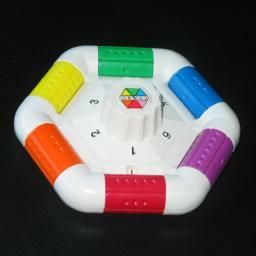 The top half of the puzzle is marked with numbers 1 to 6, and has a label on top indicating which colour belongs at which edge. The bottom layer is also marked with numbers 1 to 6, which can be seen through a little gap in the top layer. This allows you to see the relative position of the bottom layer without having to turn the puzzle over. The puzzle is closely related to the NetBlock Ufo, and also the Smart Alex. The Combo Puzzle was invented by David Ayers, and it has two patents, US 4,708,345, 24 November 1987 and US 4,881,738, 21 November 1989. There are 36 pieces, all of them different. Every permutation of them is possible so there are 36! = 371,993,326,789,901,217,467,999,448,150,835,200,000,000 = 3.72·1041 positions. If you count rotations of the layers as different, then there are 6 times as many. Despite these large numbers, most of the puzzle is easy to solve. Phase 1: Solve the top halves of five cylinders. Hold the puzzle so that any unsolved cylinder is at the front. Note which colour it should be. Find piece 1 of that colour. 1. turn it to the bottom layer, on the outside of the cylinder. 2. turn the bottom layer to bring the piece to the front. Turn the front cylinder to bring piece 1 to the top front of the cylinder. Find piece 2 of that colour. If piece 2 lies in the front cylinder in the top layer, then turn it to the bottom half, but so that piece 1 is still in the top half. Turn the bottom layer to bring piece 2 to a cylinder with an unsolved top half. If necessary, turn the front cylinder so that piece 1 is back in its original position at the top front. Turn the cylinder with piece 2 so that it lies at the bottom front. Turn the bottom layer to bring piece 2 to the front. Turn the front cylinder to bring piece 2 to the top front of the cylinder, below piece 1. Repeat steps e-k but now for piece 3 instead. The top half of the front has now been solved. Repeat the whole procedure a-l four times more, so that all but one of the top halves are solved. Phase 2: Solve the bottom halves of five cylinders. Hold the puzzle so that the cylinder with the unsolved top half is at the front. Align the bottom layer so that a 1 is visible in the window. Choose on of the other unsolved cylinders, and note its colour. Find piece 6 of the chosen colour. If it is not in the front cylinder, then turn the bottom layer to bring it to the front. Turn the front cylinder to bring piece 6 to the top front of the cylinder. Turn the bottom layer to bring to the front the bottom half of the cylinder you are solving. It is easier to first align the layers so that 1 shows in the window, before doing this. Turn the front cylinder so that piece 6 moves to the front of the bottom layer. Align the bottom layer so that a 1 is visible in the window. Piece 6 is now in the correct cylinder, below piece 3. Find piece 5 of the chosen colour. 1. Turn the bottom layer so that piece 5 is in the front cylinder. 2. Turn the front cylinder so that piece 5 moves to the top half, but piece 6 remains in the bottom half. 3. Turn the bottom layer back, so that 1 shows in the window again. 4. Turn the front cylinder so that piece 5 moves to the bottom half. 5. Turn the bottom layer so that piece 6 is in the front cylinder. 6. Turn the front cylinder so that piece 6 lies at the bottom front. 7. Turn the bottom layer back, so that 1 shows in the window again. Piece 6 should be back to where it was, and piece 5 now lies in a different cylinder. If piece 5 is not in the front cylinder, then turn the bottom layer to bring it to the front. Turn the front cylinder to bring piece 5 to the top front of the cylinder. Turn the bottom layer to bring to the front the bottom half of the cylinder you are solving. Note that piece 6 is now directly below piece 5. Turn the front cylinder so that piece 6 moves down to the front of the bottom layer. Turn the bottom layer back again so that a 1 is visible in the window. Pieces 5 and 6 is now in the correct cylinder, below piece 3. Repeat steps j-p, but for piece 4 instead. The cylinder should now be solved. Repeat the whole procedure c-q four more times, so that five of the six cylinders are completely solved. To shorten the description of the last phase, I will need some notation. Let U denote an turn of the front cylinder so that the pieces at the front move up. Similarly, D means a downward turn. A turn of the bottom layer to the right (clockwise when viewed from the bottom) is denoted by R, and a turn to the left by L.
Phase 3: Solve the last cylinder. Rotate the last cylinder so that as many pieces as possible are in their correct positions. Find any two pieces you want to swap (choose two so that at least one of them is correct after swapping). 1. Turn the cylinder so that the two pieces are at front of the cylinder. 2. Do the move sequence R DD L DD R U L U R DD L U R U L DD R DD L UUU. 3. Turn the cylinder back to its original position. 1. Turn the cylinder so that the two pieces are at top and bottom of the cylinder. 2. Do the move sequence R DD L U R D L UU R UU L DD R U L D R UU L U. 1. Turn the cylinder so that the two pieces are at top front and top back of the cylinder. 2. Do the move sequence U R DD L U R DD L U R DD L UU R D L D R D L U.
Repeat the steps b-e above until the cylinder is solved.